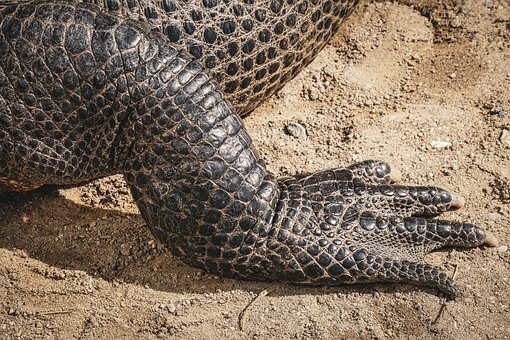 Thanks to our reader Soojin Oh who sent us the idea, she is the winner of the third "Alien Hand Syndrome and Other Too-Weird-Not-to-Be-True Stories" book we are giving away! 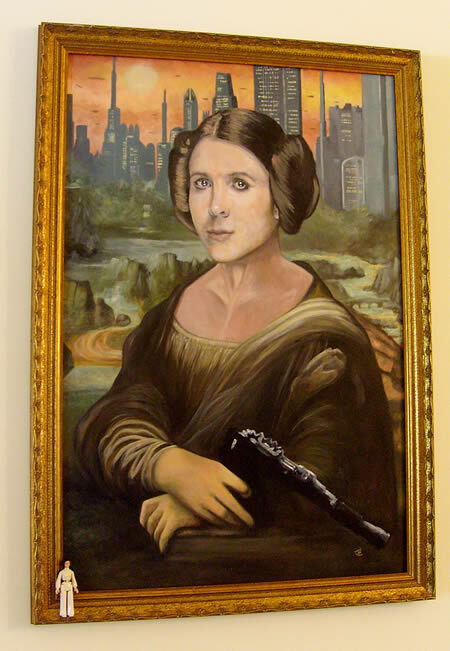 Artist Jim Hance painted this geek parody of the famous Mona Lisa — ostensibly titled "Mona Leia". Marco Pece is an Italian photographer with a fascination with Lego. An art lover himself, his recent work recreates famous paintings in perfect detail, using the ubiquitous bricks. 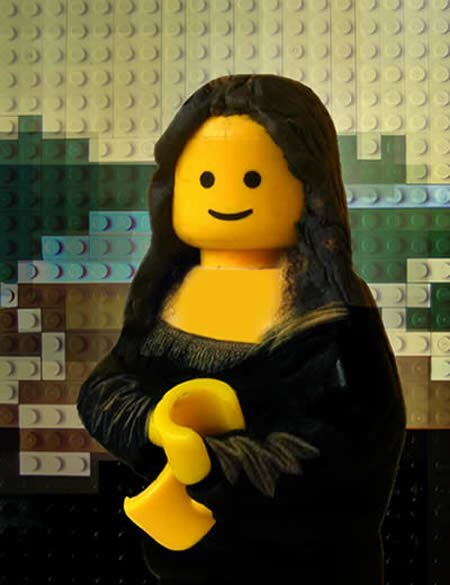 This is his Mona Lisa with Lego. 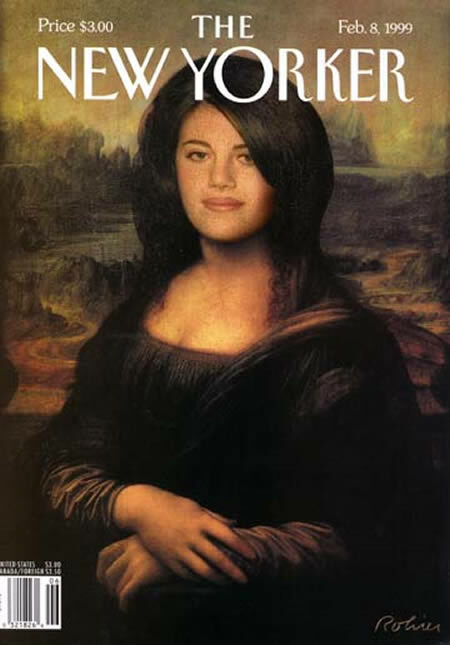 The famous cover of New Yorker Magazine depicting Monica Lewinsky as the Mona Lisa was very controversial. The clever and attractive image plays on multiple characteristics of its subject: Monica was known among friends as "Mona," the images of her in the popular press emphasized her mouth and smile (with appropriate innuendo), and in both Monica and Mona there flies the uncertainty of the nature of her relationship with a great celebrity. 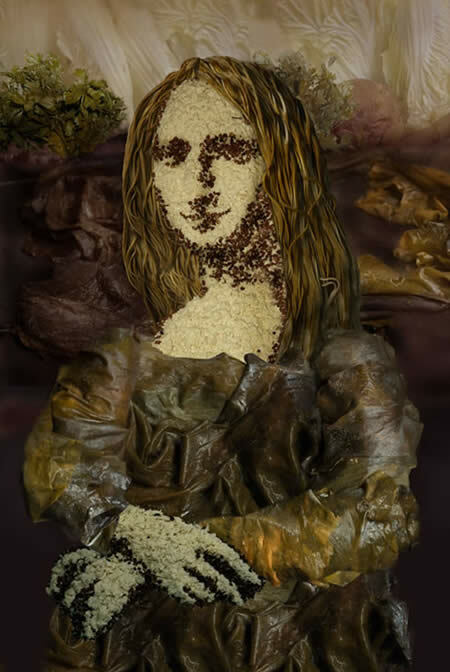 Mona Tofu, made out of rice, sea kelp, and tofu by vegetable artist Ju Duoqi. Created over three months by the employees of the Takashimaya department store in Japan, this Mona Lisa recreation (among other pieces) is made entirely of recycled train tickets. 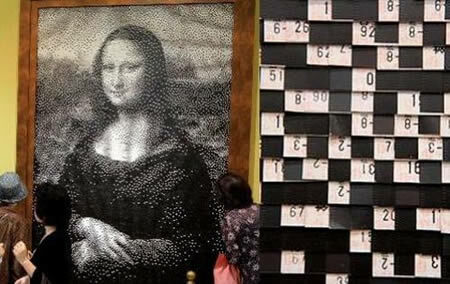 Over 320,000 old tickets were used to recreate the Da Vinci masterpieces of The Mona Lisa, The Birth Of Venus, and Renoir's Dance At The Moulin De La Galette. 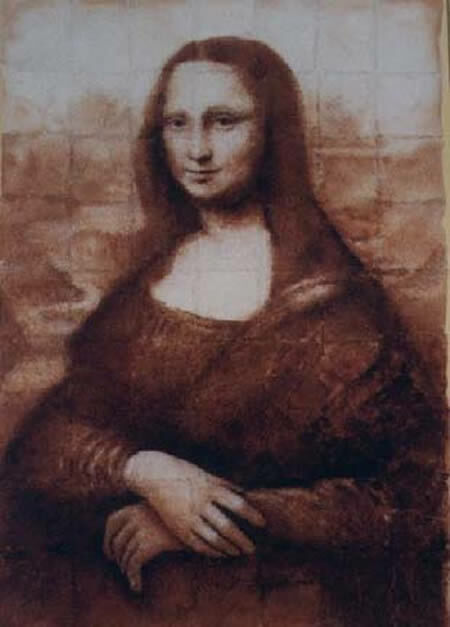 Artist Phil Hansen recreated the infamous Mona Lisa — using burger grease. He used 14 grease-laden burgers to create the unusual masterpiece for an American fast food company — who wanted to show how much grease was in their competitor's burgers. 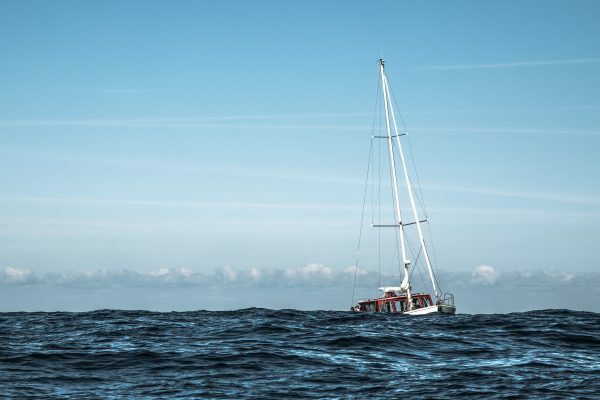 A South Croydon woman named Tania Ledger had a unique yearning by artist Chris Naylor. 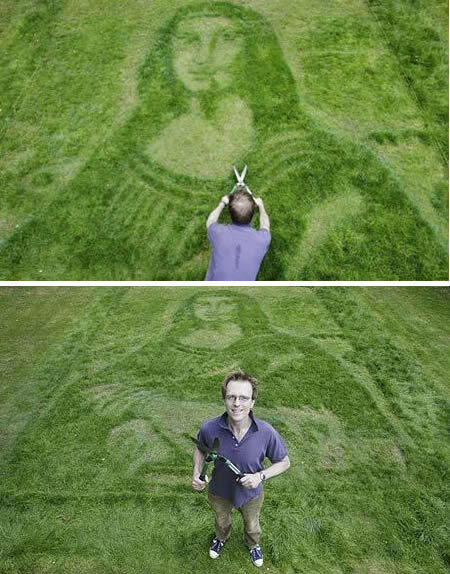 The 3D Art Expert used some basic garden tools and a lawnmower to recreate a Mona Lisa in Tania's South London lawn. 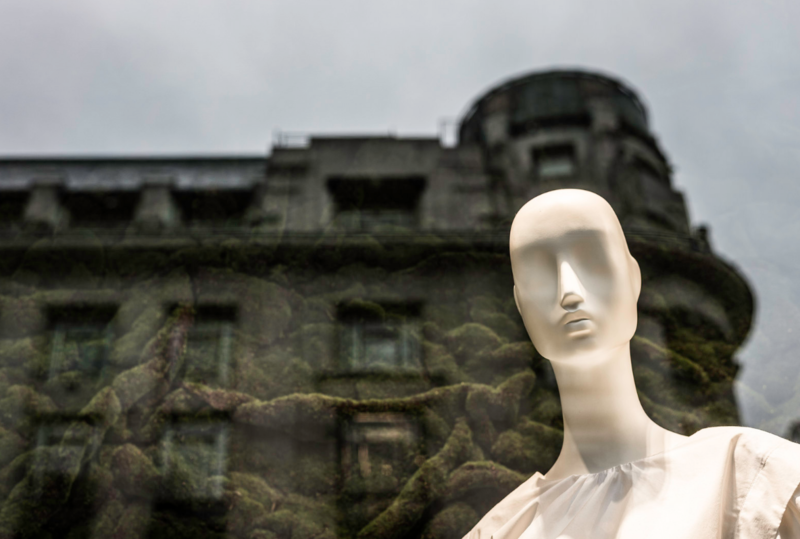 Working with nature's canvas he carefully prepared the surface, trimmed the blades of grass and over the course of two days the woman with the enigmatic smirk came to life. Colombian Painter Fernando Botero is now famous for being one of the first artists to use the horrors of Abu Ghraib as inspiration for his work. 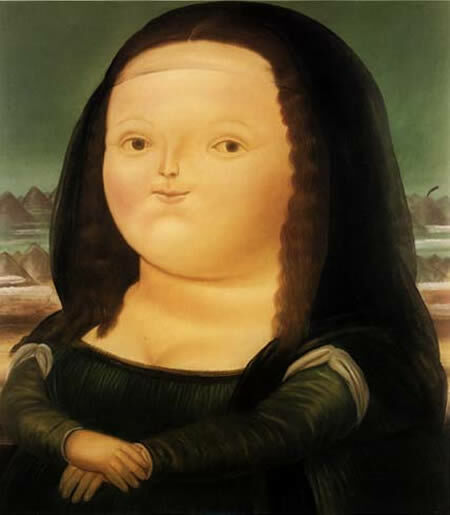 But some years ago he was known for renditions -- some might call them parodies -- of Old Masters, like this Fatso Mona Lisa. The Mona Lisa on Toast by Tadhiko Okawa recreated Da Vinci's Mona Lisa ... from 1,426 pieces of burnt toast. 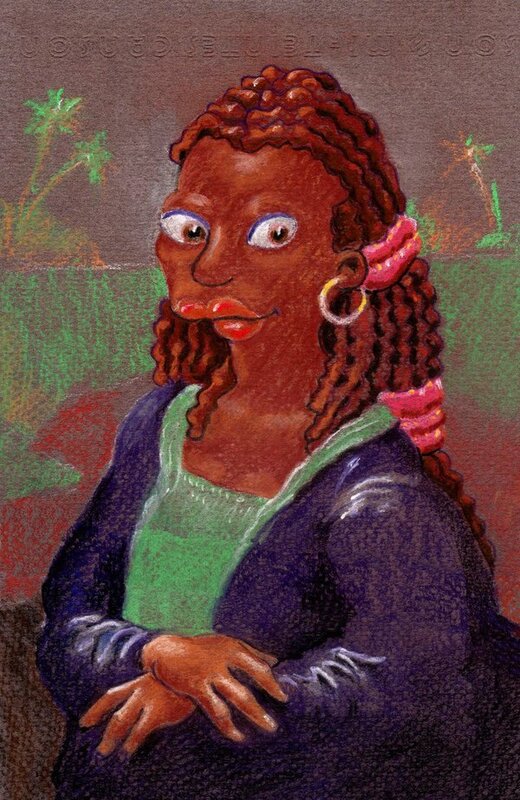 Mike Jensen made this Futurama Monalisa parody. 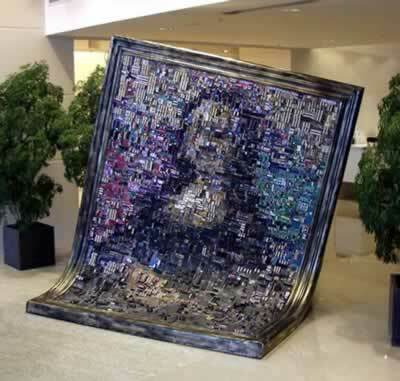 This Mona Lisa was made of computer chips (ASUS headquarters). 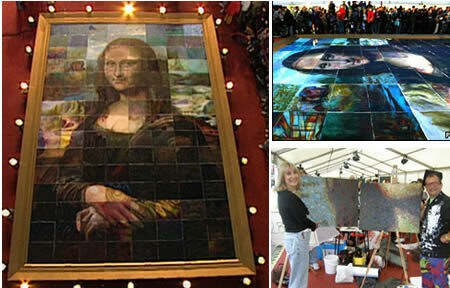 On 28 August 2005, as part of the Edinburgh Fringe Festival, Rolf Harris brought together 120 artists at The Mound, Edinburgh, beside the National Galleries of Scotland, to recreate Leonardo Da Vinci's Mona Lisa on a 9-metres x 6-metre canvas. The event was organized by Edinburgh Council, the National Galleries of Scotland and the BBC who will show the program live to launch a new series of art programs by Rolf Harris, featuring the Great Masters. 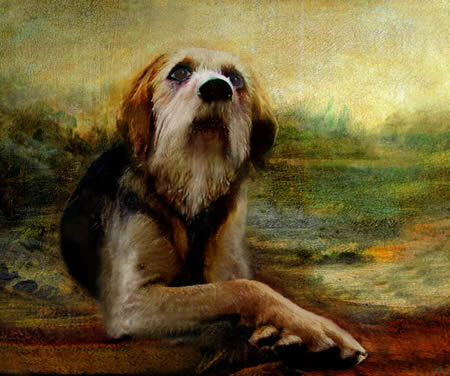 This painting, titled Jacob's Dog, is known to be a painting of the real life dog Ms. Honolulu (aka "Lulu"), the pet of Lost executive producer Jack Bender. 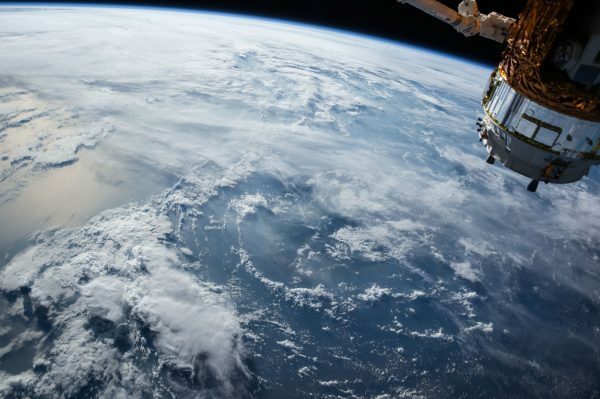 It was in real life created by artist Thomas Hannsz.